Sting of the Bee is available now on Amazon in both print and Kindle editions. Click the photograph for purchase details. I am proud to introduce my first publication, Sting of the Bee: A Day-By-Day Account of Wounded Knee and the Sioux Outbreak of 1890 – 1891 as Recorded in the Omaha Bee, from Russell Martial Research. Following is the back cover description and an abridged version of my introduction to the compilation. The language of the day was harsh and reflects the strong views that many Americans held of the native tribes following more than two and a half centuries of persistent conflict with the indigenous communities that first occupied the continent. To our twenty-first century sensibilities, the articles and commentary are replete with racist and visceral remarks that provide an unvarnished perspective of life in the Midwest at the closing chapter of conflict with the American Indian. These news reports are provided to the western historian, Americana scholar, and Indian wars enthusiast as an unfiltered glimpse into an American tragedy that unfolded on the front pages of papers from the Atlantic to the Pacific a century and a quarter ago. However, an undeniable reality was that the country’s native populations were in steady decline. By some estimates, American Indian numbers had dwindled from 600,000 at the beginning of the century to less than 230,000 by 1890, a period that saw the nation’s population explode from just five million to more than twelve times that number. The once dominant race of peoples on the continent was, under the reservation system, arguably the most marginalized minority. 1890 saw Republican President Benjamin Harrison, who inaugurated the custom of displaying the American flag daily on all federal buildings, unfurl a new forty-three-star spangled banner on the Fourth of July, adding five white stars for the states of North Dakota, South Dakota, Montana, Washington, and Idaho. Wyoming entered the Union a week later as the forty-fourth state, the first with women’s suffrage. Patriotism also soared with the formation of the National Society of the Daughters of the American Revolution. In contrast, the Lakota peoples saw the renewed patriotic fervor in the form of further encroachment on their lands. In early 1890, President Harrison opened to settlement what remained of the Great Sioux Reservation in North and South Dakota, with boomers and townsite companies snapping up the choicest acreage. Many of the Northwestern tribes saw the Great Father continuing to take more of their lands, eliminating their way of life, and leaving little to sustain a basic existence. On the front of social and economic equality, 1890 saw the new Republican administration hire the first female White House staffer, Indiana stenographer Alice B. Sanger. New York City, home to more than one and a half million people, saw the formation of the General Federation of Women’s Clubs fostering the improvement of lives through volunteerism. Pennsylvania native and New York World journalist, Elizabeth Cochrane, gained fame under the pseudonym of Nellie Bly when she traveled around the world in seventy-two days, hailed as being eight days quicker than Jules Verne’s character, Phileas Fogg. In the District of Columbia, Susan B. Anthony headed up the newly unified National American Woman Suffrage Association. While at Chicago, Illinois, the National Afro-American League, a precursor to the National Association for the Advancement of Colored People, was formed to promote racial solidarity and self-help. Columbus, Ohio, saw the formation of the United Mine Workers of America dedicated to adequate wages and safer working conditions for the nation’s coal miners. Meanwhile, in the Midwest, for the second consecutive summer, drought parched the plains between the Missouri River and the Rocky Mountains. The sun scorched what little crops the Lakota were able to grow in the alkali-tainted lands. Congress cut the Sioux appropriation by $100,000 that year after having reduced the beef issue by twenty percent the previous year, issuing a million pounds less from 1888 to 1889. According to the 1876 treaty with the Sioux, the Indians at the Standing Rock Agency alone were shorted over 485,000 pounds of beef, more than 760,000 pounds of corn, and over 280,000 pounds of flour in the fiscal year of 1890. Compounding the shortages, the hearty cattle raised in the southwest lost as much as forty percent of their body mass from the time they were sold to the government until they were issued to the Indians at the reservation agencies in the Dakotas. Failed crops, reduced rations, and fewer and smaller beef issues were leading the Lakota nation down a path to starvation. In late summer 1890, Congress took measures to restrict monopolies and cartels by passing the Sherman Antitrust Act. This law was aimed at some of the world’s wealthiest businessmen, the robber barons of the Gilded Age. They were men like Standard Oil’s John D. Rockefeller, steel magnate Andrew Carnegie, railroad tycoons Cornelius Vanderbilt and Jay Gould, and the timber industry’s Friedrich Weyerhauser. In the Dakotas, what few jobs that were available on the reservations were doled out mainly to white men that had connections to the Indian agents, who, appointed under the home-rule policy, were little more than local politicians rewarded with their appointment for garnering votes for the incumbent party. The progressive American way of life offered no progress to its original inhabitants. Facing starvation with no jobs, no income, and little hope for carving out a niche in the land of the free, the Lakota saw only a barren future. Many western Indian tribes turned to the belief in a messiah that would deliver them from their plight and restore them to their heyday. 1890 headlines of American sports saw the Brooklyn Dodgers, known as the Bridegrooms, win the National League championship a year after they won the American Association title, the only club to win back to back titles in different leagues. John Owen, Jr., of the Detroit Athletic Club became the first man to run one hundred yards in under ten seconds, a record that stood for three decades. At West Point, New York, the Naval Academy’s midshipmen shut out the Military Academy’s cadets twenty-four to zero in the first ever Army–Navy football game. And, to the roar of 2,000 San Franciscan fans, Jack “Nonpareil” Dempsey successfully defended the world’s middle weight boxing title against Australian Billy McCarthy with a twenty-eighth-round technical knockout when Dempsey refused to continue pummeling the badly beaten McCarthy, who agreed to cede the fight. But as 1890 drew to a close, the headlines of newspapers across the country and around the world were dominated daily by enthralling reports of potential Indian outbreaks across the Dakotas, this, at a time when the nation thought war with the aboriginal peoples was a closed chapter. Americans were riveted by correspondents’ often unsubstantiated claims of horrific depredations, false reports of stunning military defeats, and ultimately the real and tragic destruction of almost an entire band of Miniconjou Lakota at the hands of the U.S. Army’s renowned 7th Cavalry Regiment along the Wounded Knee Creek. It was an event that came to define 1890 and the one-term presidency of Benjamin Harrison. The impact of the events surrounding the Sioux reservations in November, December, and January of that winter were felt in small communities across the Dakotas and the border states of Montana, Wyoming, Minnesota, Iowa, and Nebraska. The farmers, ranchers, and settlers of the Northwest read with fascination of a mysterious Indian spiritual movement dubbed by the press as the Indian Messiah craze or the Ghost Dance religion, they read how its fanatical adherents danced themselves into a feverish pitch that could only be quenched when the white race was swallowed by the earth, and they read that those same Sioux warriors were arming themselves in greater numbers than during the height of the Great Sioux War. Those events were most widely and wildly reported in the major urban areas of the region, cities like Minneapolis, St. Paul, Bismarck, Des Moines, and Omaha. Readers craved news of the apparent looming Indian war, and the newspapers readily obliged the public’s unquenchable thirst for any and all information from the Dakota region. The potential outbreak was front page news across the country. In Omaha, the Bee ran its first article on the new Indian religion on November 13 on page two, and followed up five days later with another report on the “New Christ” as the lead story on the upper fold of the front page. From November 18, 1890, until January 28, 1891, for all but three days, the Bee reported on the Ghost Dance religion and the Sioux outbreak. It was front page news on all but four of those days and the lead story for fifty-four days during the ten week period. Founded by Edward Rosewater, a Jewish-Bohemian emigrant, by 1890 the Bee had been in circulation for two decades under Rosewater’s editorial management with a daily readership of just under 20,000. At forty-nine-years of age, Rosewater was in his prime as a newspaperman. He had settled in Omaha during the Civil War in 1863, four years before Nebraska became a state, when Omaha was little more than a village with a population of about 2,000. He had recently completed an enlistment with the telegraph corps in the nation’s capital, a position that saw him transmit to the world President Lincoln’s Emancipation Proclamation. Rosewater was an ardent Republican, and his self-taught mastery of the English language coupled with his telegraphic experience provided the bedrock upon which he based the newspaper he launched in 1871. Amounting to little more than a political pamphlet, Rosewater titled his publication the Bee as it provided the sweetness of honey with political sting. The Bee grew steadily, thrived throughout the West, all but supplanted the city’s other papers, and eventually was recognized as one of the foremost newspapers in the Midwest, if not the country. As Omaha grew, so too did the Bee’s readership. Located between the Missouri and Platte Rivers and just north of the confluence of those two natural shipping lanes, Omaha’s population by 1880 had almost doubled from 16,000 in 1870 to 30,000. It grew again almost five fold by 1890 with over 140,000 residents, making it the twenty-first most populous city in the country and one of the largest between the Missouri River and the Rocky Mountains. In January 1890, the Omaha Bee had a daily readership of 19,300 with its Sunday edition reaching 22,300 Nebraskans. Reporting on the Sioux outbreak clearly increased the Bee’s circulation. By January 1891 the Daily Bee’s readership was reaching over 29,000 and the Sunday Bee more than 35,000 readers, almost a fifty percent increase in one year. There was a clear spike of copies sold in the weeks following the tragedy at Wounded Knee. The sting of the Bee reached far beyond Omaha with Rosewater’s paper serving as an Associated Press outlet. As such, many of the Bee’s articles from Pine Ridge were printed in papers across the country, even in those that had their own correspondents reporting from South Dakota. Rosewater retained and increased his circulation by providing world, national, regional, state, and local news. The Daily Bee ran eight pages in length, and the Sunday Bee anywhere from twelve to twenty. He staffed his newspaper with reporters who traveled across the state, had feature writers, and regular political correspondents in Chicago, New York, and Washington. Rosewater’s success was due largely to his ability to give his readers what they demanded: sensational news reporting with captivating narrative. Some contemporaries also viewed the Bee’s reporting during the troubles in the Dakotas in the winter of 1890 and 1891 as overly dramatic. In early December, “Buckskin Jack” Russell, a former army scout and interpreter for Buffalo Bill’s Wild West Show, waxed poetic while taking a jab at the sensational reporting in Rosewater’s newspaper. As they charge—in the Omaha Bee. The first correspondent that Rosewater dispatched to the Pine Ridge Agency, and the most widely criticized both by contemporaries and historians alike, was Charles Herbert Cressey, a thirty-three-year-old native of Cannon City, Minnesota. “Will” Cressey was the thirteenth and last child of an aging Baptist minister, Rev. Timothy R. Cressey, who died when the boy was barely a teenager. Five years younger than his closest sibling, there were only six children living at home by the time Cressey was born. During the war, his father, at the age of sixty-one, went off to serve for two years as a chaplain in the Second Regiment of Minnesota Volunteers. Later his pastorate took the family to various locations across Minnesota, Indiana, Illinois, and Iowa. Will Cressey spent his formative years in Des Moines where he graduated from high school, then attended the Chicago University for a couple of years before he began a profession as a newspaper correspondent in the early 1880s. Cressey’s ability to dig up a story where seemingly there was none was evident early in his career. A peer writing in 1891 of the then widely known Bee correspondent provided the following anecdote concerning Cressey’s start in the business when he first arrived in Omaha a decade earlier. Applying for a position at The Republican, the city editor charged Cressey with producing a story worthy of publication, a difficult job for someone unfamiliar with the city and what the paper had already covered. Cressey saw some men digging a trench in the middle of a side street. On inquiry he found it was the beginning of Omaha’s cable car system. His news sense told him he had a good thing, and he hunted up the head of the enterprise, a kindly gentleman, who showed him the plans and filled him full of facts. The next morning his article appeared under a big head on the first page, and he has never had to ask for a position since. That Cressey could craft an engrossing article from something as mundane as men digging a trench was a skill he put to effective use at the Pine Ridge Agency in the fall and winter of 1890, particularly on days when there were few events that were newsworthy. His assignments at the Bee usually involved covering legal cases in Omaha’s courts, but that fall Rosewater sent Cressey to South Dakota to cover the potential Indian outbreak. It was Will Cressey’s pen that provided the Bee’s greatest sting that winter. His articles almost always ran on the front page and twenty-five times were the lead story of the day, reading more like a western dime novel than a serious news article. Because the Bee was an Associated Press outlet, Cressey’s stories made headlines in papers all across America making him perhaps the most published of the almost two dozen correspondents reporting from Pine Ridge. Cressey went to great lengths to obtain information that he deemed newsworthy. In addition to interviewing soldiers, scouts, guides, cowhands, friendly Indians, and just about anyone with an intriguing rumor, Cressey employed the services of the daughter of Chief Standing Elk to serve as an interpreter and an Indian named Rocky Bear—recently returned from the European tour with Buffalo Bill’s Wild West Show—who would bring back information from what were deemed to be hostile camps. Cressey described his efforts to obtain newsworthy items in a letter he sent to the Pittsburg Dispatch, “I secured the best scouts possible, and daily had them make secret trips into the camp of the Indians who were regarded as unfriendly. I myself obtained an interpreter and daily went up and down through the camp of the friendlies first-handed and kept up with every move of any importance that was contemplated.” Cressey indicated that at one point early in the campaign the senior military commander confronted him about the detailing of military movements in his articles and directed him to refrain from divulging such sensitive information in future dispatches. The lead Bee correspondent went so far as to offer up a dog to a group of “hostile” Indians for their supper in order to obtain an interview, the dog being brought along for just such a purpose. As the Bee received criticism, so too did Cressey. Charles W. Allen, publisher of the Chadron Democrat and one of the New York Herald’s correspondents at Pine Ridge, decades later recalled of Cressey, “This writer had a penchant for lurid, long-drawn-out stories—they seemed to please his managing editor and were a constant source of amusement to the rest of us.” Allen went on to say that Cressey enjoyed “grabbing thrilling rumors and converting them into something he considered a ‘scoop’ on his rival [Thomas H. Tibbles of the Omaha World-Herald], though to the balance of the bunch they more nearly resembled puffballs.” Interestingly, the New York Herald, for whom Allen wrote, was one of those newspapers that regularly printed copy from Cressey’s articles. Cressey’s ability to know where a good story may turn up led him to being one of only three reporters on the scene at Wounded Knee at a time when a veritable hoard of correspondents and photographers had descended on Pine Ridge. The other two were the aforementioned Allen of the New York Herald and William F. Kelley of the Nebraska State Journal. According to Allen, he and Cressey worked together on their copy while cataloguing and tabulating facts. Cressey’s description of the carnage that unfolded on December 29 was one of the first accounts that brought the tragic news of that sanguinary event to the nation and was reprinted on front pages across the country from the Los Angeles Herald to the New York Times. With General Forsyth and Major Whitside, I stood, when the firing started, within touching distance of the treacherous devils. The only thing that saved all three of us from death was that the Indians had their backs turned towards us when they began firing. Their first volley was almost as one man, so that they must have fired a hundred shots before the soldiers fired one. But how they were slaughtered after their first volley! 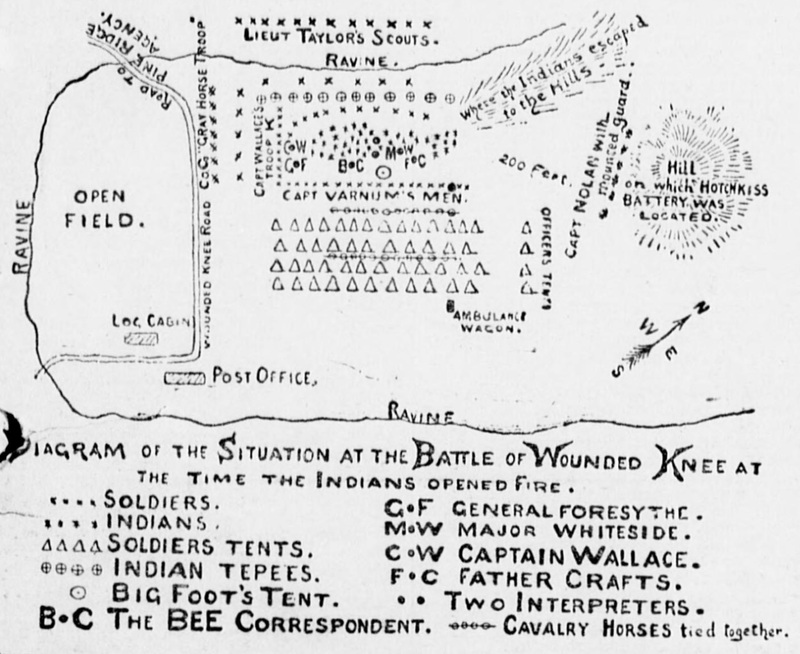 Charles H. Cressey’s “Diagram of the Situation at the Battle of Wounded Knee” was published on the front page of the January 7, 1891, edition of the Omaha Bee. Cressey, Kelley, and Allen had worked out a lottery system to determine whose reports would be sent over the wires first. The three correspondents found a daring and willing courier to ride—albeit for the exorbitant fee of $75—nearly forty miles to the closest telegraph operator on the Elkhorn railway. Fortune shined on Kelley that 29th day of December, 1890, as his report was the first telegraphed to the country. Cressey’s short initial report was received in time to make a special evening edition of the Bee and was reprinted the following morning. However, a quick search of key words from the three reporters’ articles reveals that Kelley’s report was published almost three times that of Cressey’s and more than tenfold that of Allen’s. On the most critical day of the campaign, Cressey had been scooped by one of his contemporaries. He more than made up for it with follow on articles that provided further detail of the battle and army casualties, which, again, were widely publicized. While many of Cressey’s competitors criticized his dramatic style, he was hailed by others as being one of the finest reporters at Pine Ridge. The Philadelphia Ledger often printed many of Cressey’s articles and subsequently sang his praises. The Indian war near the Pine Ridge Agency has developed another war correspondent…. He writes for The Omaha Bee, which paper has been the chief source of information respecting the movements of the Indians. The Bee correspondent differs from more famous war chroniclers in that he simply relates facts as he sees or hears them and leaves criticism to others. He has been remarkably accurate in his statements, though sometimes twenty-four hours ahead of government reports, and he deserves honorable mention for keeping a cool head and sticking to facts, instead of glorifying himself after the usual fashion of war correspondents. Similarly, only two articles were actually attributed to Copenharve in the pages of the Bee, with the simple close of “Cope.” Cressey, on the other hand, concluded his articles with his monogram, “C. H. C.” This, perhaps, caused some confusion when Copenharve arrived at Pine Ridge, as he had the same initials. Toward the end of December, the Bee’s lead correspondent spelled out his last name, “Cressey.” The numerous “Specials to The Bee” from Pine Ridge that were unattributed were likely from Copenharve and O’Brien, particularly in the latter part of January, as the last article attributed to Cressey was on January 6, while the Bee continued to receive specials by telegram into February. Edward Rosewater’s success as a newspaper man could not be more demonstrable than in the magnificent edifice he constructed to house his enterprise: The Bee Building. 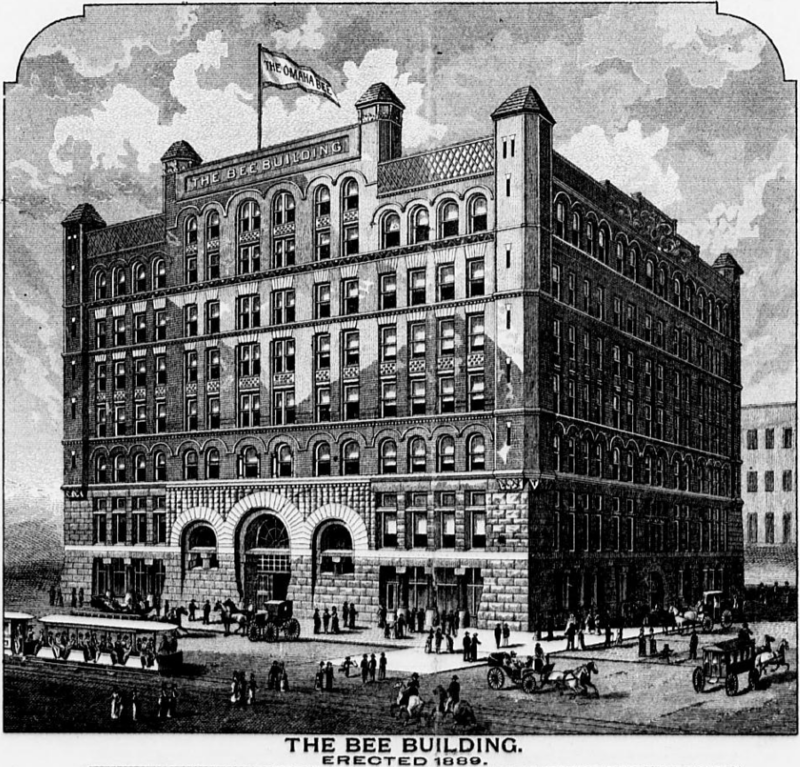 Built for the princely sum of a half million dollars and opened in 1889, The Bee Building was advertised as the “Palace Office Building” of Omaha and claimed to be absolutely fire proof. It boasted of night and day elevator service, incandescent lighting, and perfect ventilation. Built prior to the new city hall and county courthouse that would sit adjacent to and across the street from The Bee Building, Rosewater’s palace dominated downtown Omaha in 1890. Constructed on the site of Rosewater’s former home, the building was seven stories of red granite accented with beehives carved on the exterior stonework and ornamenting each doorknob. The structure functioned as an office complex with the newspaper’s plant in the basement, and some of the most prominent businesses of the River City occupying its seven floors. When it opened, Rosewater could boast that the Omaha Bee was churning out its sting in the largest building of any newspaper in the country, save that of the New York World. Filling the offices of the entire fifth floor of The Bee Building was the headquarters of the U.S. Army’s Department of the Platte. The Bee provided a detailed accounting of its military occupants in the 1891 New Year’s edition. “The department of the Platte embraces the states of Iowa, Nebraska and Wyoming… the territory of Utah and so much of the state of Idaho…. The headquarters of the department are at Omaha in The Bee building with Brigadier General John R. Brooke in command.” This accommodation made General Brooke a well-known face to the principle owner and editor of the Midwest’s most prominent newspaper. It also assured that the Bee staff was privy to the comings and goings of that military organization at the onset of the supposed Sioux outbreak, and that they were familiar with the general who would command the troops converging at the Pine Ridge Agency. After the outbreak had been resolved and the military departed Pine Ridge, the Bee’s correspondents returned to Omaha where their lives took divergent paths. Historians have recorded little concerning the careers of Cressey, Copenharve, and O’Brien. Will Cressey’s life after Pine Ridge is difficult to trace. At the end of the 1890s, he met with some moderate success in Cincinnati writing at least two books which were known familiarly as “Cressey’s Unusual Zoo Stories.” The books were in essence pamphlets marketed toward children, the first being forty-eight pages and the second, an expansion of the first, to seventy-two pages. The pamphlets, popular with visitors to the Queen City’s zoo, were titled Original Stories, Exclusive Pictures, Unusual Gossip of the Wild-as-Ever Animals of Quality at The Zoo, and sold for ten cents, making each book a dime novel of a different sort. While other correspondents were covering America’s war with Spain, Cressey was writing of his two years of daily “hobnobbing with the wild-as-ever Kings and Queens and lesser of the jungle royalty at the Zoological Gardens.” In 1902, Cressey was mentioned as the editor and publisher of a new Indianapolis based monthly magazine, The Steno-Typer, devoted to the craft of typewriting and shorthand dictation. A decade later Cressey was working in St. Louis as a reporter and magazine writer. He remained in the Gateway to the West for seventeen years and died there in March 1926 at the age of sixty-eight, his death certificate listing him as a reporter by trade. Will Cressey never married, and was buried in the Valhalla Cemetery in Bel-Nor, St. Louis. Charley Copenharve continued for about six months as the telegraph editor for the Bee. In August 1891, he moved to Butte, Montana, began work with the Anaconda Standard, and continued with that paper for twenty-six years. He worked variously as the dramatic editor, mining editor, courthouse editor, city editor, and, ultimately, the managing news editor. In 1916, he was considered for a gubernatorial appointment as Montana’s commissioner of the bureau of publicity and agriculture. Copenharve did not pursue nor receive the position, and retired from the Standard as a relatively wealthy man in 1917. With his health failing, he relocated his family to Los Angeles where he died in October 1918 at the age of fifty-six. Charley Copenharve was survived by his wife, Cora, of thirty years, and his daughter, Helen, and son-in-law, Louis Lorenz. Ed O’Brien also left Omaha in the early 1890s and settled in Oakland, California, reporting for the Oakland Tribune and the Oakland Enquirer. O’Brien was instrumental in the taking of the Oakland census in the early 1900s, serving as the Census Marshal, and was commended by the city council in 1902 for his work. He was occasionally referred to by the military rank of major as early as 1901 and “promoted” to colonel by 1909, although there is no record of O’Brien ever having served in the regular or volunteer army. The military titles seemingly were a nod to his work as an Indian war correspondent in the winter of 1890 and 1891. O’Brien later covered state politics and the state legislature in Sacramento. He apparently never married, and, according to city directories, lived at various hotels over the course of two decades. All record of Ed O’Brien vanishes after 1914 when he was about sixty years of age. He likely died about that time period. Edward Rosewater continued to run his expanding newspaper for another fifteen years, but in his lifetime the circulation of the Bee only occasionally reached the peak it attained in January 1891. Popular, if not controversial, within the Republican Party, Rosewater made an unsuccessful bid for one of Nebraska’s U.S. Senate seats in 1902, and again in his final year of life. He died on August 30, 1906, while working late at the Bee Building and was found the next morning sitting upright, as if deep in thought. Rosewater was active up to his last day, having delivered a speech that afternoon to the Grand Army of the Republic at their camp ground in Waterloo, Nebraska. Management of the Bee transferred to his thirty-five-year-old son, Victor, and the paper’s sensationalist style continued well into the twentieth century. In 1919, the yellow journalism of the Omaha Bee was viewed by many as inflammatory to racial tensions that erupted into riots that summer, resulting in a mob assault of Omaha’s mayor and the subsequent lynching of an African American man. The Rosewater family sold the newspaper the following summer. It was acquired by newspaper tycoon William Randolph Hearst in 1928, and he sold it in 1937 to Rosewater’s fiercest rival, the Omaha World-Herald, whose owners promptly terminated the Bee’s publication. The selection of articles for this compilation is but a fraction of the material recorded in the Omaha Bee covering the Sioux outbreak of 1890–1891. The compiler focused primarily on dispatches from Pine Ridge though the Bee received specials from across the region. The few articles presented here that were not from Pine Ridge provide context or critical details not otherwise reported, including the original first-hand account of the battle of Wounded Knee by an officer on the scene. Until now, Lieutenant John Kinzie’s description of the battle in the pages of the Bee has gone unnoticed by historians. The two non-Bee articles, one from the Pittsburg Dispatch and the other from the Detroit Free Press, provide a rare glimpse into Cressey’s retrospective view of that winter’s events and his only firsthand account of his actions during the battle, again, overlooked by historians. This compilation includes some minor editing of apparent typographical print errors, including the correction of frequent misspellings of names. Through exhaustive research, the compiler has determined the identities of most of the hundreds of individuals detailed in print and indexed many of them by their full names. The exception to these corrections concerns the Bee’s multiple listings of military casualties from the Wounded Knee and White Clay Creek fights, which displays the army and the press’s inability to compile and publish an accurate list of dead and wounded. Correct names of these casualties are provided in the footnotes and are also indexed. These articles presented here are an important collection of period news reports, and represent some of the most widely published daily accounts of the Sioux outbreak. To be sure, Will Cressey’s specials were both criticized and acclaimed by his peers, and he was likely the most read war correspondent during that troubled time frame. The country’s collective memory of Wounded Knee and the events that unfolded in the winter of 1890 and 1891 have been formed and reformed through conflicting accounts and historical analysis of that American tragedy. Returning to the pages of the newspapers of the day provides a valuable perspective of the events as they occurred in one of the most read papers of the Midwest. The sting of Edward Rosewater’s Omaha Bee is a harsh, contemporary reflection of those events and their impact on a nation progressing toward the twentieth century. Order your copy of Sting of the Bee now at Amazon in both print and Kindle editions. Click the photograph for purchase details. Sting of the Bee was meticulously compiled and edited by Samuel L. Russell, an Army Colonel with over 27 years of active service. He is currently assigned to the U.S. Army Peacekeeping and Stability Operations Institute at Carlisle Barracks, PA, and is the author of ArmyAtWoundedKnee.com. Col. Russell graduated from the Virginia Military Institute in 1988 with a Bachelor of Science in Civil Engineering. He holds a Masters of Military Art and Science in history from the Army’s Command and General Staff College and a Masters of Strategic Studies from the Army War College. U.S. Census Bureau, “Table 1. Nativity of the Population and Place of Birth of the Native Population: 1850 to 1990” (https://www.census.gov/population/ www/documentation/twps0029/tab01.html), accessed 23 Feb 2015; Department of the Interior, Report on the Population of the United States at the Eleventh Census: 1890, part 1 (Washington: Government Printing Office, 1895), xxvii. Michael R. Haines, Richard H. Steckel, eds., A Population History of North America (Cambridge: Cambridge University Press, 2000), 24. “History of the Flag,” San Francisco Morning Call (4 Jul 1890), 5; “The Deed Is Done,” Salt Lake Herald (11 Jul 1890), 1; “Daughters of the Revolution,” Los Angeles Herald (13 Oct 1890), 1. “Opened the Reservation,” Omaha Daily Bee (11 Feb 1890), 1. “She Knows Their Secrets,” Pittsburg Dispatch (6 Apr 1890), 20; “Club Women in Council,” New York Evening World (23 Apr 1890), 2; “Nellie Bly There,” Pittsburg Dispatch (26 Jan 1890), 1; “Woman’s Suffrage Association,” Salt Lake Herald (20 Feb 1890), 1; “Colored Men’s Rights,” Washington Evening Star (23 Jan 1890), 6; “Call for a Meeting of Miners,” Indianapolis Journal (2 Apr 1890), 1. “Prices of Food: The Cost of Living Increased by the Unprecedented Drought,” St. Louis Post-Dispatch (1 Aug 1890), 1; Nelson A. Miles, “Report of Major General Nelson Miles, Headquarters Department of the Missouri, Chicago, Ill., September 14, 1891,” from Annual Report of the Secretary of War (Washington: Government Printing Office, 1892), 132—140. Gen. Miles enumerated eleven major failings of the government to adhere to treaty obligations and directly correlated those failures as causes for disaffection among the Northwest tribes in the fall of 1890. “Applying the Anti-Trust Law,” Omaha Daily Bee (29 Sep 1890), 4. Heather Cox Richardson, Wounded Knee: Party Politics and the Road to an American Massacre, 170. “Brooklyn Wins Again,” New York Times (26 Oct 1890), 8; “It Was a Glorious Day,” Sunday Herald and Weekly National Intelligencer (12 Oct 1890), 1; “Uncle Sam’s Cadets Kick,” New York Sun (30 Nov 1890), 2; “Jack Dempsey Regains Prestige by Knocking Out Billy McCarthy,” New York Evening World (19 Feb 1890), 1. James W. Savage, John T. Bell, and Consul W. Butterfield, History of the City of Omaha, Nebraska and South Omaha (New York: Munsell & Company, 1894), 575—577; J. Sterling Morton, Illustrated History of Nebraska, vol. 1, 744—745; Albert Shaw, ed., The Review of Reviews. An International Magazine. vol. 13 (New York: The Review of Reviews Co., Jan–Jun 1896), 709—710; Charles A. Bates, ed., American Journalism (New York: Holmes Publishing Co., 1897), 270—271; Jacob Rader Marcus Center of the American Jewish Archives, “Rosewater Family Papers” (http://americanjewisharchives.org/ collections/ms0503/#top) accessed 17 Sep 2014. Morton, Illustrated History of Nebraska, 746. Circulation numbers were printed in the Sunday Bee on page 4. George R. Kolbenschlag, A Whirlwind Passes: News Correspondents and the Sioux Disturbances of 1890-1891, 16—17. Library of Congress, “About Omaha Daily Bee,” Chronicling America: Historic American Newspapers, (http://chroniclingamerica.loc.gov/lccn/ sn99021999/) accessed 15 Sep 2014. John W. Russell, Chicago Inter-Ocean (11 Dec 1890), 6; also found in Kolbenschlag, A Whirlwind Passes, 1; and Charles W. Allen, From Fort Laramie to Wounded Knee: In the West That Was, 180. Roger L. Di Silvestro, In The Shadow of Wounded Knee: The Untold Final Story of The Indian Wars, 223, originally reported in the Chadron Democrat on 27 Nov 1890. “Situation in the Northwest,” Omaha Daily Bee (25 Nov 1890), 4. The Old Northwest Genealogical Society, The “Old Northwest” Genealogical Quarterly, vol. 7, no. 1. (Columbus: Press of Spahr & Glenn, 1904), 246—257. “The Life of a Reporter,” Logansport Pharos-Tribune (10 Apr 1891), 19. Charles H. Cressey, “A Squaw’s Warning,” Omaha Daily Bee (20 Nov 1890), 1; Cressey, “Life Among the Red Men,” Omaha Daily Bee (8 Dec 1890), 6; Cressey, “Hounded By Hunger,” Omaha Daily Bee (25 Nov 1890), 1. “Various Topics,” Capital City Courier (21 Mar 1891), 1; “A Sioux Inferno,” Detroit Free Press, (9 Aug 1896), 19; “From the Frontier,” Pittsburg Dispatch, (1 Feb 1891), 9. Allen, From Fort Laramie to Wounded Knee, 178. On December 30, 1890, the New York Times ran an earlier Cressey article on their front page in which Cressey described Big Foot’s surrender to Maj. Whitside and the 7th Cavalry. Cressey, “A Bloody Battle,” Omaha Daily Bee (30 Dec 1890), 1. “Various Topics,” Capital City Courier (21 Mar 1891), 1. “A Great War Correspondent,” Omaha Daily Bee as reported in Philadelphia Ledger (8 Jan 1891), 1. Charles H. Copenharve, “Henry’s Cavalry Dash,” Omaha Daily Bee (1 Jan 1891), 1. Kolbenschlag also indicates that the Bee correspondent traveling with the 9th Cavalry was likely Copenharve. The author of this article also may have been O’Brien, but there is no definitive way of determining which of the two Bee correspondents rode out with Henry and his Buffalo Soldiers. Cressey stated in his article “Captured Indians Escape,” on December 24, 1890, “No correspondents accompanied Colonel Henry, for the reason that he is going too wide of the seat of war and is to do simply scouting.” If Cressey was correct, the possibility exists that one of the three correspondents crafted this first person account based on later interviews with officers from the 9th Cavalry. J. M. Wolfe & Co., Omaha City and South Omaha City Directory for 1891, vol. 17, 653; Edward A. O’Brien, “The March of the Forces,” Omaha Daily Bee (26 Jan 1891), 2. Ed. F. Morearty, Omaha Memories: Recollections of Events, Men and Affairs in Omaha, Nebraska from 1879 to 1918, 165; Savage, Bell, and Butterfield, History of the City of Omaha, 160 and 169—170. “A Military Center” Omaha Daily Bee (1 Jan 1890), 14. Cressey, Original Stories, Exclusive Pictures, Unusual Gossip of the Wild-as-Ever Animals of Quality at The Zoo Together with an associate feature entitled Swans in a Quiet City (Cincinnati: Charles Herbert Cressey, 1899), iii; Jerome B. Howard, The Phonographic Magazine, vol. 16, no. 12 (Cincinnati: Dec 1902), 289. “Death Removes C. Copenharve,” Anaconda Standard (Butte, MT: 9 Oct 1918). “Good Work of Postmaster,” Oakland Tribune (16 Dec 1902), 2; “Major Edw. 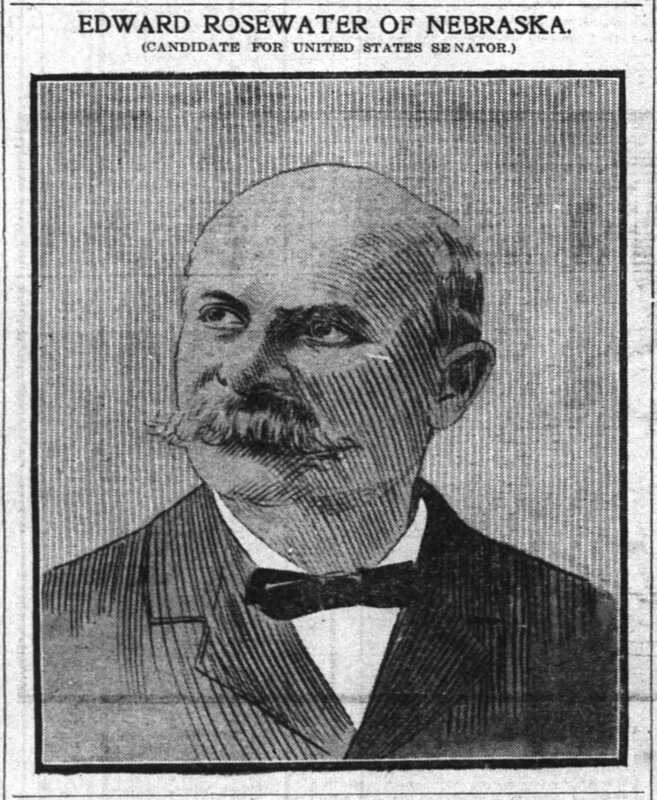 A. O’Brien Is Known at Vallejo,” Oakland Tribune (6 Aug 1901), 5; “Col. Ed O’Brien,” Oakland Tribune (16 Jan 1909), 10. “Edward Rosewater Dies Very Suddenly,” Omaha Daily Bee (1 Sep 1906), 1; “Edward Rosewater’s Last Speech,” Omaha Sunday Bee (2 Sep 1906), half tone section page 1; Library of Congress, “About Omaha Daily Bee,” Chronicling America. Citation for this article: Samuel L. Russell, “Introduction,” Sting of the Bee: A Day-By-Day Account of Wounded Knee and the Sioux Outbreak of 1890 – 1891 as Recorded in the Omaha Bee , ed. 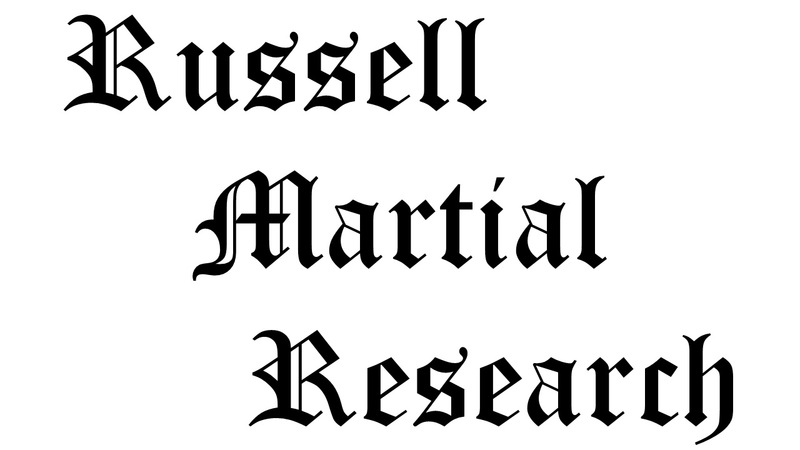 Samuel L. Russell (Carlisle, PA: Russell Martial Research, 2016), xi-xxxiv. This entry was posted in Newspaper Articles and tagged 1890, 1891, 7th Cavalry, 7th Cavalry Regiment (United States), Battle of Wounded Knee, Cavalry Troop, Charles Cressey, Department of the Platte, ghost dance, Lakota, Nelson A. Miles, Oglala Lakota, Omaha Bee, Pine Ridge, Pine Ridge Agency, Pine Ridge Campaign, Pine Ridge Indian Reservation, Sioux, Sitting Bull, White Clay Creek, Wounded Knee, Wounded Knee Creek, Wounded Knee Massacre. Bookmark the permalink. Congratulations Sam, looks like this will be a real winner! Hi Sam— I’m trying to order a printed copy of your book, but cannot seem to access on Amazon. Is it indeed available yet in that format?